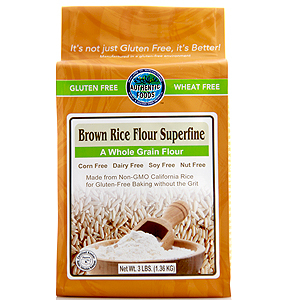 The Authentic Foods Superfine Brown Rice Flour is made from the highest quality California rice and has the absolute best particle size for gluten free baking. Besides not having the grittiness associated with most rice flours, the Authentic Foods Superfine Brown Rice Flour contains more vitamins, protein and fiber than many flours such as white rice flour. It contains approximately 7% protein, 70% carbohydrates, 5% dietary fiber and 2% fat. This flour has a mildly sweet and nutty flavor. It is often used in gluten free baking as a substitute for wheat flour (7/8 cup Authentic Foods Superfine Brown Rice Flour = 1 cup wheat flour) or when combined with other gluten free flours.